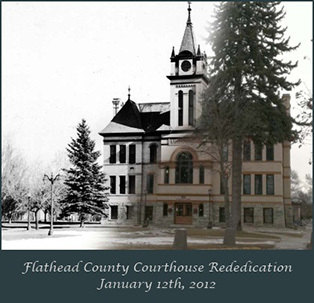 Flathead County is in the process of a major courthouse restoration and renovation project. Grant funds have been obtained and non-property tax funds have been set aside for the past seven years. This will allow us to complete what we consider to be a legacy project that will provide continued use and enjoyment of this landmark structure by future generations. The Flathead County Courthouse was erected in 1902. With new seismic standards and requirements we will improve and strengthen the structural integrity of this historic and much used public building. This project will also allow us to bring the courthouse into compliance with current electrical, fire sprinkler/alarm, environmental (asbestos/lead/etc. ), mechanical and other building codes. The Courthouse is a three story structure and it is amazing that we have come to this point in time without having been required to provide full access with an elevator. Installation of an elevator system serving all three floors will be a major component of this project. Specific grant funds have been obtained to improve energy efficiency by replacing all of the Courthouse windows. Some windows have been covered over with fiberboard and interior building additions. This project component will create significant budget savings and improve the interior and exterior look of the Courthouse. As mentioned above, we have been awarded a U.S. Department of Energy grant in the amount of $126,300 to replace all of the Courthouse windows with energy efficient units that meet historic design and specification requirements. These new windows will improve the exterior and interior look of the Courthouse in a major way. We will use $210,000 of county museum funds generated from a real estate title transfer to fund portions of the project that will restore the grand stairway and the three main corridors and provide for museum item space on the walls and display cases. The museum items displayed will obviously depict the history of Flathead County. We also received a historic preservation grant in the amount of $50,000 for these same elements of this restoration portion of the project. The grand stairway mentioned above will involve recreating the section removed between the second and third floors to construct an office and storage space many years ago. This major renovation and restoration element will again expose all the front windows to provide natural light to the interior. It will also allow the public to see the grand staircase from the exterior of the building. Another phase of the project will involve moving the east and west annex buildings to other locations. The west annex (commissioner's offices) will be moved to Fairground property for use by 4H/Ag-Extension staff. We will move the east annex to an undetermined location and there is no use specified for this space at this time. This phase will allow for more parking and appropriate landscaping. The Courthouse structure will re-establish its central and proud landmark status that was intended by the county fathers who had the vision to select this unique location and attractive setting. $2,200,000 - non real estate tax dollars set aside annually over the past seven years. Most of the current offices and personnel will continue to be located in the Courthouse when the project is complete. The Clerk/Recorder and staff for the Plat Room, Recording and Elections will be located on the entire first floor and east half section of the second floor. The GIS department will be located on the east half of the second floor. The Finance and Human Resources departments will be located on the west half section of the second floor. The Commissioner's office and meeting chambers will be located on the third floor. Three Information Technology (IT) staff members who have been located in the Courthouse in the past will move to the lower level of the Justice Center next to the IT offices located there. There will be a net gain of four personnel occupying Courthouse office space upon completion of this project.